At Bagram, War's Tragedy Yields Medical Advances U.S. deaths in Afghanistan topped 500 this year, with thousands more wounded. Many of the injured pass through the hospital at Bagram Air Field. Treating so many war wounds brings its own grim benefits: New data are helping save lives in ways that were impossible only a few years ago. 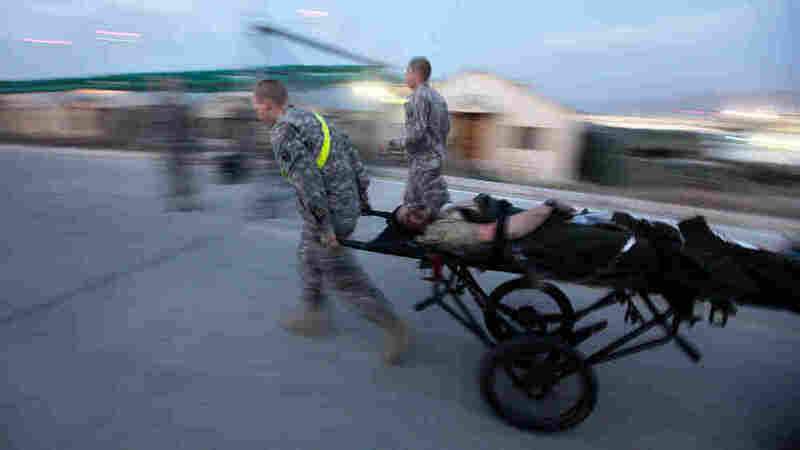 A U.S. soldier is brought to the emergency room at the U.S. hospital at Bagram Air Field, north of Kabul, after he was wounded by a roadside bomb in Wardak province, June 2009. The facility uses both cutting-edge technology as well as old techniques discovered anew to treat the massive number of wounded soldiers who pass through. The medevac choppers land and then taxi over to the gate just outside the emergency room, where gurneys are waiting. Nightfall has brought a bone-chilling wind, and a gang of nurses and orderlies rushes four patients into the warmth of the ER. It's more than warm inside. In fact it's 100 degrees. It's the first clue that this hospital -- the Joint Theater Hospital at Afghanistan's Bagram Air Field -- is a little different. Through years of war, combat surgeons have learned that hypothermia is a big risk in patients with significant blood loss. Nine years of conflict in Iraq and Afghanistan have brought some grim benefits: a new wealth of knowledge about treating war wounds. "At the beginning of this conflict, we were taking the best trauma medicine from the civilian sector, and we brought it to Iraq and Afghanistan," says U.S. Air Force Col. Chris Benjamin, the hospital commander. He says now his doctors tell him it's the other way around. 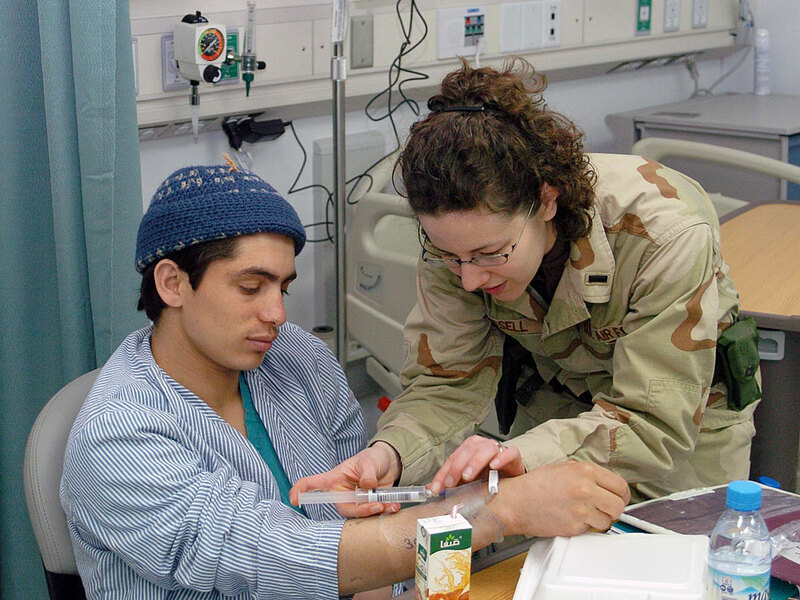 Medical nurse Karis Russell flushes an IV in patient Rahmat Shah's arm, in March. "Here we are seven, eight years later, taking what we've learned in these conflicts to teach them the advances that we've made with this data collection here in theater," he says. The year 2010 saw more violence than ever in the nine-year-long war in Afghanistan. NATO deaths topped 700 this year, more than 500 of them Americans. Counting the limbs lost would yield a much higher number: Advances in body armor mean that soldiers are surviving huge roadside bomb explosions, but coming into the hospital missing one or both legs, and sometimes an arm as well. The vertical blasts from the bombs often cause terrible wounds to the genital area. 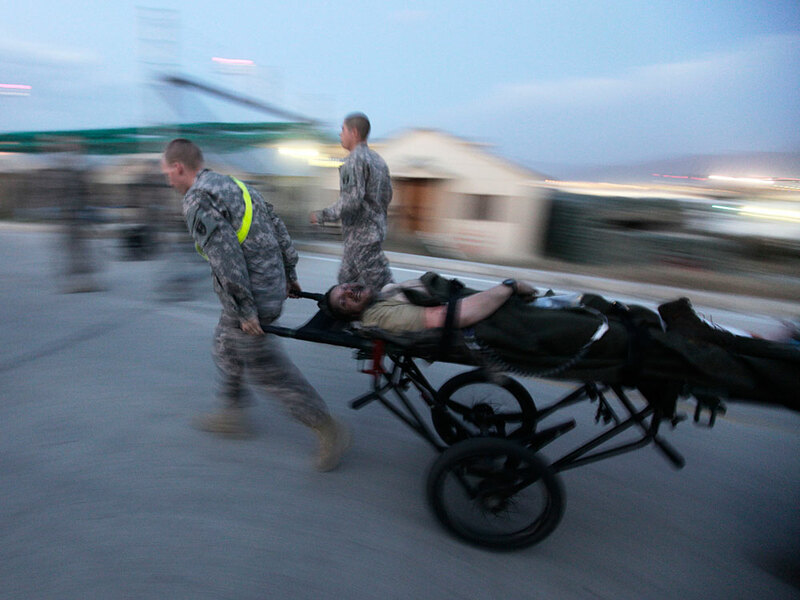 Most of the wounded pass through Bagram on their way from the field hospital to long-term care in Germany or the U.S. The volume of patients continues to yield new data that are helping to save lives in ways that were impossible only a few years ago. Aggressive use of tourniquets, which have been used on the battlefield for hundreds of years, is helping to stop bleeding within moments of injury. 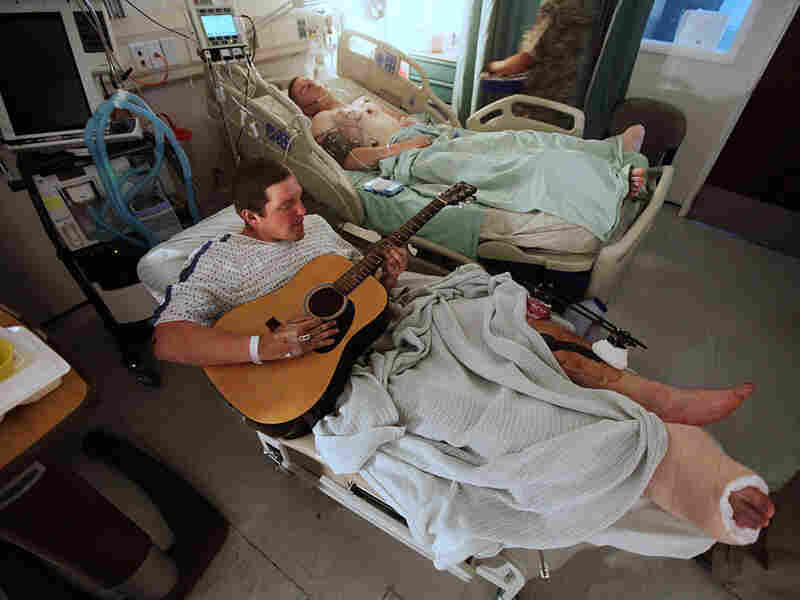 "The soldier out in the field that encounters an explosion or a gunshot wound, the most important part in his chain of survival from the explosion, until we can get him to Walter Reed [Army Medical Center in Washington, D.C.] probably is what his battle buddy does -- the guy in the next vehicle or the guy who was 50 meters away," says Benjamin. It's pretty exciting to take care of people that literally died on the table at a down-range theater yesterday, come to us, and within a few hours, we can take his breathing tube out and they're talking to their family. Only a decade ago, tourniquets were a last resort, thought to carry serious risks of doing harm. But early during the Iraq War, soldiers began carrying their own tourniquets, and now all U.S. troops carry special tourniquets designed for use with one hand. The change reflects the chilling number of wounds that involve lost limbs. "I could probably count on one hand how many double amputations I'd had to take care of or do [before]," says U.S. Air Force Lt. Col. Rachel Height, Bagram's head surgeon. Now, she says, they come in almost daily and in large clusters where a huge, deadly bomb has hit a foot patrol. Height points to another old cure that has been discovered anew: whole blood. Over many decades, scientists found ways to break blood into its components -- white and red cells, platelets -- and store them each with a different shelf life. But the carnage of U.S. battles in Iraq forced doctors to hold blood drives right on base, and they discovered that fresh, whole blood works wonders at resuscitation, says Height. "It's pretty exciting to take care of people that literally died on the table at a down-range theater yesterday, come to us, and within a few hours, we can take his breathing tube out and they're talking to their family," she says. In Vietnam, saline was used to keep blood pressure up, but that seeped into the respiratory system, causing a deadly ailment known as Danang Lung. Whole blood leaves the lungs healthier, which means patients can avoid a host of potential problems associated with ventilator machines and general anesthesia. U.S. soldiers recover at the Joint Theater Hospital at Bagram Air Field, June 2009. Most of the patients at Bagram stay only a few days on their way to long-term care in Germany or the U.S.
Another new tool is letting patients stay awake, even during major operations. "We use little tiny catheters put in next to nerves, and these guys with amputations don't have pain in those stumps," says U.S. Air Force Maj. Christa Riley, an anesthetist. "We can anesthetize a large nerve that serves the legs and make them comfortable for flight." Flight is another important tactic at Bagram. Most of the wounded are on their way to a much larger hospital in Germany or the U.S. within a day or two of arriving here. That way, the doctors at Bagram can concentrate on the next batch of patients. But that innovation means sometimes the doctors at Bagram never even get to talk with the patient whose life they're saving, says Riley. "Just be able to tell them, I'd like to be able to tell them, 'Hey, you did well, you're strong and thank you,' " she says. But it also spares the doctors at Bagram some of the more painful moments, she says. A colleague was taking care of a soldier who had just lost both legs, but was, unusually, awake and off the ventilator. "One of our nurse anesthetists was there when the young man called his mother to tell her, and I think he broke down, he had to leave. Because he could hear this young man's mother crying and sort of falling apart on the other end of the phone," Riley says. 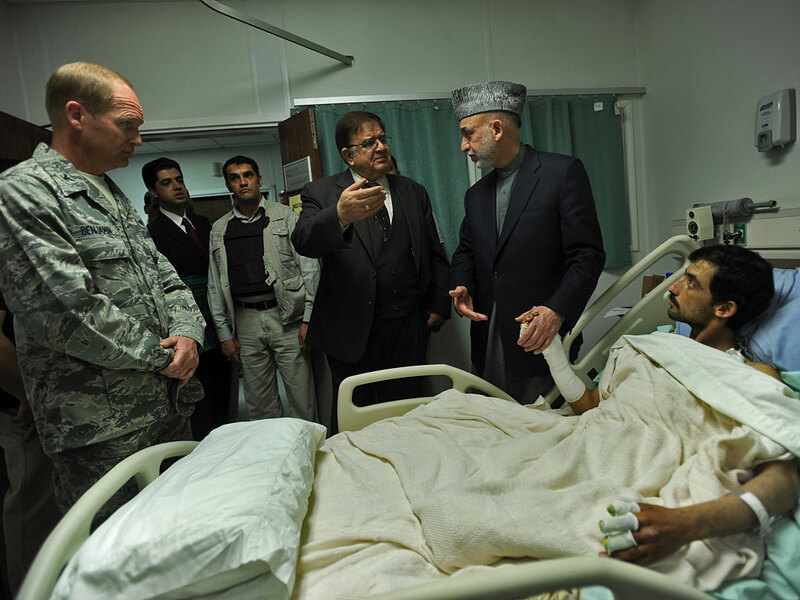 Afghan President Hamid Karzai (standing, right) talks to his defense minister, Abdul Rahim Wardak (standing, second right), as he visits a wounded Afghan National Army soldier at Bagram hospital in May. The hospital treats soldiers from all the NATO countries in theater, as well as Afghan soldiers, and quite often captured insurgents. The doctors say the detainees get the same care, though they're usually under armed guard. Afghan civilians also come to Bagram if they're recovered by U.S. medevac from a battlefield injury or if a local hospital refers them. One such patient has been in Bagram for three weeks, 13-year-old Saber Jan. Her clothing ignited from a cooking stove, causing severe burns on nearly 50 percent of her body. The doctors have tried skin grafts without success and concluded that only a better facility will be able to save the girl's life. One of the doctors has contacted the Shriners Hospital in Cincinnati, which agreed to take the patient, but a few obstacles remain. Saber was married a few months ago and her husband's brother is staying with her at the hospital. He says it would be much better for her to stay in Afghanistan, and he would need to ask the family's permission for her to go to America. It's not clear he understands that Saber will probably die if she doesn't get better care -- even inside the hospital, she won't be able to resist infection much longer with half her skin gone. In fact, the doctors are surprised Saber has survived this far. "She is fighting, and I think that's giving the doctors here some hope," says Riley. "Dr. Height said to me, 'I can't give up on her because she's not giving up.' And I think that's fair." But red tape may be the greatest obstacle to saving the young girl's life. Saber needs a passport and a visa, or a special dispensation from the American or Afghan government -- a condition the doctors at Bagram haven't figured out how to cure yet.